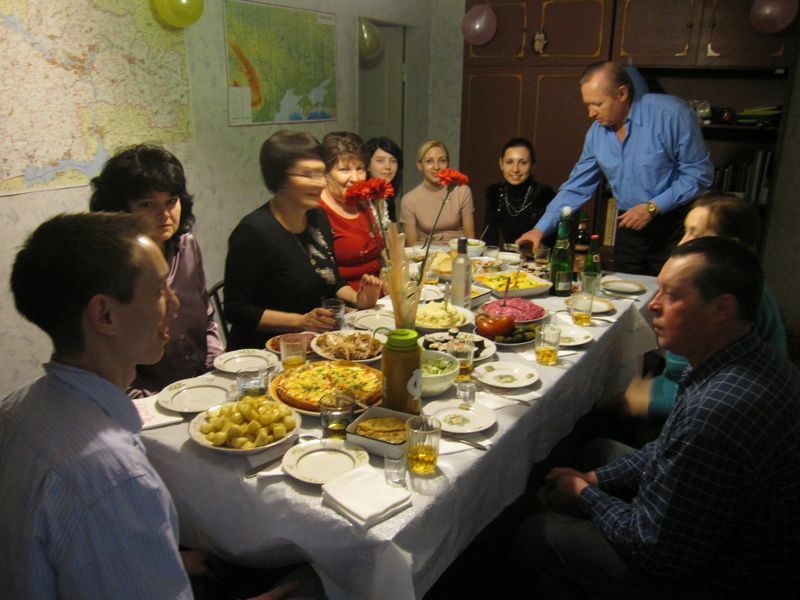 It turns out that birthdays are a Big Deal here in Ukraine. 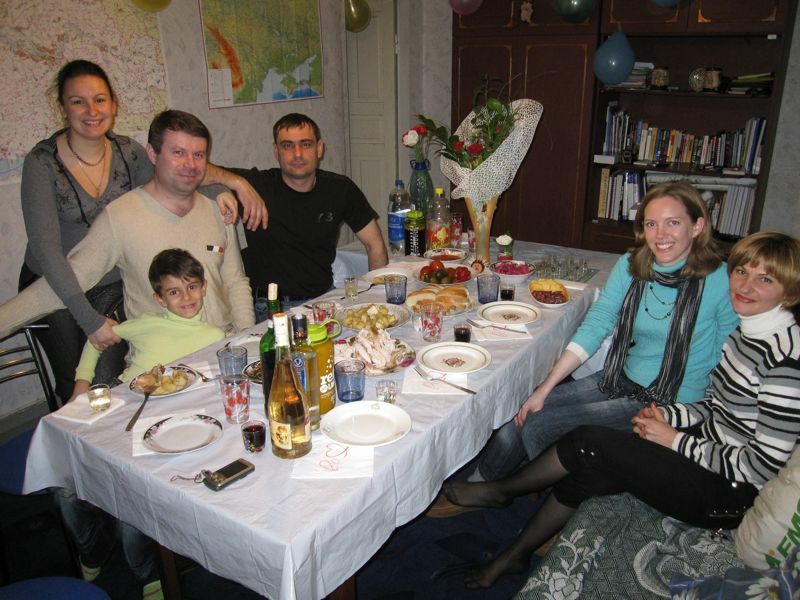 Ask a Ukrainian what their favorite holiday is, and a lot of them will say “my birthday”. It’s been almost a year, but, if I recall, back home we don’t even consider birthdays to be “holidays” per se. Well, I found out last week that your birthday can sure feel like a holiday here. On my actual birthday Wednesday, I was instructed to show up at the teachers lounge after 3rd period (during the long break). Now, I had some idea what was coming, but my Ukrainian colleagues still managed to blow me away. My director, vice-director, gave lovely little speeches and set out a big colorful cake. Then, a woman from the administration, who had apparently come from the rayon office just for this, gave a nice speech and gave me flowers and a certificate. Then, about 15 kids from various classes paraded in wearing party hats and holding balloons. 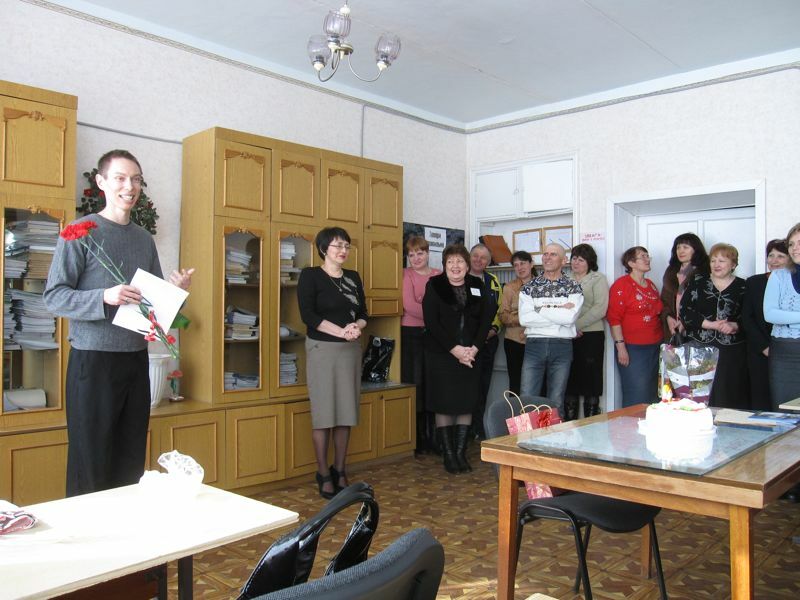 They proceeded to sing a birthday song in English which Tanya, one of the English teachers had taught them. Then, one of the boys stepped forward and recited a little English poem. Some gifts were given, and I thought we would then eat cake. Instead, they boxed up the cake and told me to take it home! Set a table with as many dishes as possible. You know you have enough dishes if, after spending some minutes rearranging to no effect, you resort to stacking things on top of each other. It helps if you have a small table. Have more napkins sitting around the edge of the table than your guests will ever need. It’s good form to hand a new napkin to guests midway through the party, whether they need it or not. Have plenty of vodka and/or wine. Do NOT run out (I’ve never seen this happen, but I’m sure it’s bad). When guests arrived, they gave me some thoughtful gifts like beer mugs and a cake plate. The proper etiquette for accepting gifts here seems to be to thank the person and set the gift aside without a second look, to open up later. Also when arriving, the guests handed us the food they brought (an absolute requirement when visiting). We put all their dishes on the table to help us fill it up. Then we started the eating and drinking. The ritual around drinking is pretty interesting. One person will designate him or herself to fill everyone’s small drinking glass at regular intervals. Pouring backhanded is very bad, as is holding your glass up to help the person pour. During the obligatory toast, everyone holds their glass in their right hand while someone says a couple words or a long speech, then everyone drinks together. Toasting has rules, too, but let’s leave that for another day. Why not two nights in a row? Anyway, to wrap this up, suffice it to say we had a good time and our Ukrainian-style party was a success. The next day, we invited our landlords and some neighbors over for a second party, which was less intensive and thankfully helped with some of the leftovers. In the end, we were glad to be able to repay in some small way all the hospitality we’ve been shown here.